Have you ever been jolted awake by the feeling of falling off a cliff right before you’re about to fall asleep? Or perhaps your body shook uncontrollably as you were closing your eyes? There is a very high chance you might have—in fact, about 70% of people have experienced this at one or multiples times in their lives. Sudden, involuntary twitching of muscles is called Myoclonus, or myoclonic jerks, and these could be a symptom rather than a disease. Nevertheless, the particular type of myoclonic jerks that we experience right before falling asleep are called hypnic jerks, and these are usually benign. Hypnic jerks—also known as sleep starts, sleep twitching, and night starts—happen as the person is beginning to fall asleep and usually resembles the feeling of a jump when a person is startled, and may also occur along with a falling sensation. The causes behind these jerks aren’t exactly 100% clear yet, as scientists are still conducting research on this subject. However, one possible explanation is that as we fall asleep, our nervous system slows down, our temperature drops and our muscles relax. 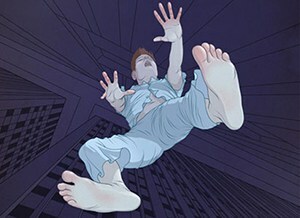 The hypnic jerks may then occur if a nerve misfires during this process, resulting in a muscle spasm. A different theory explains that as we fall asleep, our body confuses this sensation with that of falling, and thus sends signals to our limbs to move to an upright position, which ultimately results in these hypnic jerks. This theory was developed from a different evolutionary theory explaining that our ancient primate brain may confuse this sensation of falling asleep with the feeling that we’re falling out of a tree, and thus, our bodies swiftly react and take action by twitching. Although most hypnic jerks are nothing to worry about and mostly occur in healthy people, many factors can increase your chances of having them. For instance, people who experience more hypnic jerks also have a higher caffeine intake, irregular sleeping schedules, and may be going through a lot of emotional stress. Therefore, if any or all of these factors are affecting your sleep, you might want to try cutting back on caffeine and trying out relaxation techniques to feel more rested when you wake up.